Students enrolling in the Medical Imaging program are automatically eligible for a 25% tuition scholarship. 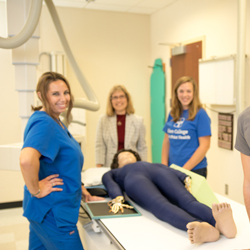 The Bachelor of Health Sciences – Medical Imaging program is a highly specialized area of diagnostic imaging and is an essential part of the healthcare profession. This program has been developed to provide students with a diversified plan of study to include Computed Tomography (CT) and Magnetic Resonance Imaging (MRI). CT and MRI are both unique in how they produce diagnostic images. CT technologists specialize in using ionizing radiation while MRI technologists utilize strong magnetic fields and radio frequencies. Both of these imaging modalities produce cross-sectional images for physicians to assist them in the diagnoses and treatment of patients. Imaging technologists must demonstrate proper patient care and ethical behaviors and strive to become autonomous learners. Responsibilities will include, but are not limited to: preparation, quality control testing, patient interviews, perform imaging procedures, administrator a contrast medium, and assisting physicians by providing quality diagnostic images. This program provides students the opportunity for additional career opportunities and advancement within the imaging profession. Students may seek admission to either the baccalaureate degree option or the certificate option. The mission of the BHS-Medical Imaging program is to provide a baccalaureate-level educational program that prepares graduates for careers and advancement opportunities in the medical imaging profession. Demonstrate technical competency in obtaining quality images. Display a commitment to professional development. The online BHS-Medical Imaging program offers students the opportunity to further their education through a blended delivery format. The online program delivers all required medical imaging didactic courses through a course management system. All clinical externship courses will be developed based on the student’s plan of study. All general education courses can be completed at any regionally-accredited institution of the student’s choice. A minimum of 124 credit hours is required for the BHS-Medical Imaging degree; 33 of those credit hours must be completed at Allen College. A certificate option is available to those who do not wish to pursue the baccalaureate degree. All program courses must be taken in sequence as they are only offered once during the program. All students admitted into the program will be required to attend orientation on campus. This orientation day will be scheduled in August prior to the start of the fall semester. Students are scheduled in clinical rotations to develop the necessary skills for a career in Medical Imaging. The Externship Courses provide students with hands-on experience while gaining additional knowledge and instruction from professional technologists. Students can choose to find their own clinical site location. In this case, it is the student’s responsibility to get approval from their desired clinical site. Clinical assignments are constructed to assure students receive equitable exposure to clinical areas. A clinical rotation schedule will be given to each student during the first week of October (prior to their spring Externship Course). The information on the schedule will allow the students to be informed of where they will be scheduled for the duration of the program. If anyone would like more information, please contact Kara Howard, Educational Coordinator, at kara.howard@allencollege.edu.